We are what we eat (and drink). A healthier life is a reflection of what we consume on a daily basis. Milk has always been an essential part of our diet since ancient times. However, adulteration and contamination of milk in recent times has been a pressing concern. To address this concern, Parag Milk Foods has now launched premium milk ‘Pride of Cows’ in Delhi. 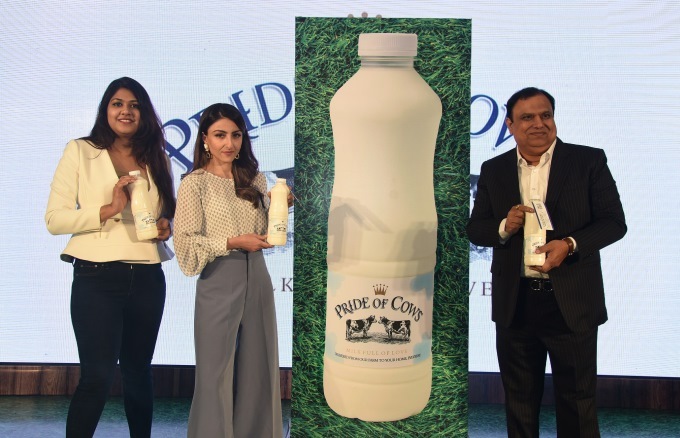 Parag Milk Foods Ltd’s Pride of Cows milk was launched in Delhi by Bollywood Actress Soha Ali Khan. It is hoped that milk consumers in Delhi will now be able to better experience the goodness of cow’s milk delivered to their doorsteps. Pride of Cows strives to encourage people who believe in finer things of life. The brand provides milk that defines the edge of purity and high quality. It involves zero human intervention and is unadulterated. The milk is priced at INR 120 per litre and the marketing follows a subscription based model. Cow’s milk is known to be a rich source of calcium, proteins and Vitamin B12. This was highlighted in a panel discussion participated by Bollywood Actress and mother, Soha Ali Khan. Renowned nutritionist Kavita Devgan was also part of this panel. Speaking at the panel, Soha said, “Since milk is one of the most powerful foods in our diet chart, I believe it’s important to be careful about the quality of milk we choose for ourselves”. Kavita Devgan added to this and shared how worried consumers and parents consult with her about removing milk from their families’ regular diet for fear of bad quality milk. “I always tell them to include milk in their diet to nourish the important building blocks of the body and recommend choosing a product in which you know the source of the milk and its quality,” she said. Since its launch in 2011, Pride of Cows has been supplying pure cow’s milk produced at the company run Bhagyalakshmi Farm in Pune. Supply is presently made to cities like Mumbai, Pune and Surat. In order to meet the demands of connoisseurs of quality milk in Delhi, the company will be airlifting farm fresh cow’s milk from Pune to Delhi every morning and delivering to consumers’ doorstep. While this may certainly be bringing unadulterated cow milk to Delhi, it will also be causing an increase in the ecological footprint of the consumers. It is hoped that Pride of Cows will initiate a new operating unit in or around Delhi in order to not depend on air travel so much. Consuming milk in present day has certainly become debatable. While one side are the benefits of milk, the other side are the ethical issues revolving around the cows and calves. Veganism also reminds us of the poor treatment given to farm animals in the milk industry. The need of the hour therefore is to ensure natural maintenance of the dairy farms and regular monitoring for ensuring no harm is brought to the animals. Top image caption: Ms. Akshali Shah, Senior VP, Strategy-Sales & Marketing, Parag Milk Foods; Ms Soha Ali Khan and Mr. Devendra Shah, Chairman, Parag Milk Foods at the launch of Pride of Cows in Delhi. A glass of milk a day keeps diabetes and all things bad away.